Every time I go to Powell I think that is the last time but I keep coming back. This last trip included some of the scariest and most beautiful moments. This talk of "whales" (rocks right under the surface) is unnerving to say the least! Nothing like scooting across the water doing 30 or so in the middle of the lake or a big open area and out of nowhere under the surface is jagged tips of rocks coming out of nowhere, unmarked and looking inches from the surface. You have to remember how unique Powell is. The terrain in the canyons that filled with water is made up of those structures. Another 50 or 100 feet of water like it used to be, no problem. Now those unmarked disasters are everywhere. I ended up spending all my time on water in fear of hitting one of those tops. Another equally terrifying moment can come from the tour boats that flies out of Wahweap up to Rainbow Bridge. A giant wake monster that in narrow channels can have that lake look like a series of tsunamis. I came up on one in a narrow area by Dangling Rope Marina and figured I would pass this beast and get him behind me. Wrong. I found myself trying to crest over his wake to scoot past him and that giant wake mountain had me struggling to get to the top and down the other side all at about 20 mph. I felt true fear and realized I was creating a situation where I could have easily been chucked off the downside of that wake and turned completely over. I felt like I was almost at a 90 degree angle. I backed off and slipped back down the face and stayed behind. I instantly realized I had faced potential death in a random moment of boating. Scary stuff. Both of these moments I was alone in my boat. I never do the dumb stuff I might do alone with anyone in my boat. These are the moments far and few between where you still feel a little edge in your life that makes you remember being alive is not to be taken for granted. I bet I am back this year. We have similar conditions here in the ocean in Salem Harbor and even Boston Harbor has certain areas littered with these "just under the surface" hazards, very dangerous. They don't mark them because there's too many of them and they can't go marking every single hazard if there is a marked channel that boats are supposed to stick to. Not sure how that works on lake Powel. It makes going out of the channel a bit more precarious, for sure. But let me ask you, aren't these areas marked (depth-wise) on whichever GPS you have? My GPS shows white colored water for water that is 20ft or deeper, and blue water for any water that is under 20ft deep. That way you can avoid the water that is in blue and stay in the white instead of trying to concentrate on specific depth sounds. Left screen. Hatem, this is a good question. I am not used to fly by instruments but maybe I should. I can see how if you are in conditions like that all the time you would get used to it. This was a first for me. The other question is how up to date are the charts with changing water levels? I have to try it out. In the old days (pre Powell) open water with nothing on the surface meant go boating. Now you have me curious to use my technology. I have a dual screen Garmin set up so it should be easy. Thank you. Hatem, this is a good question. I am not used to fly by instruments but maybe I should. I can see how if you are in conditions like that all the time you would get used to it. This was a first for me. The other question is how up to date are the charts with changing water levels? You know, that's a really great question that I don't have the answer to, TBH. Simply because in my case, I'm boating ocean and the ocean really doesn't have changing water levels in the sense that lakes do. We have tides, and while the tide fluctuates considerably here (could be as much as 12ft), it's still predictable and accounted for on GPS'. Those depth sound markings in small circles are the depths at low tide, so it's worst case scenario and often time when I'm out boating and compare my actual transducer depth to the GPS markings, it's either spot on or greater. So that's a good thing and if there is any change for whatever reason, by updating the chip every season, that takes care of any new changes that might have occured. Whereas lake water levels usually change because of drought, lack or rain or the moon and so it's unpredictable. I'm really not sure how that's to be taken into consideration. Maybe others who boat fresh water and lakes could chime in and let us know. 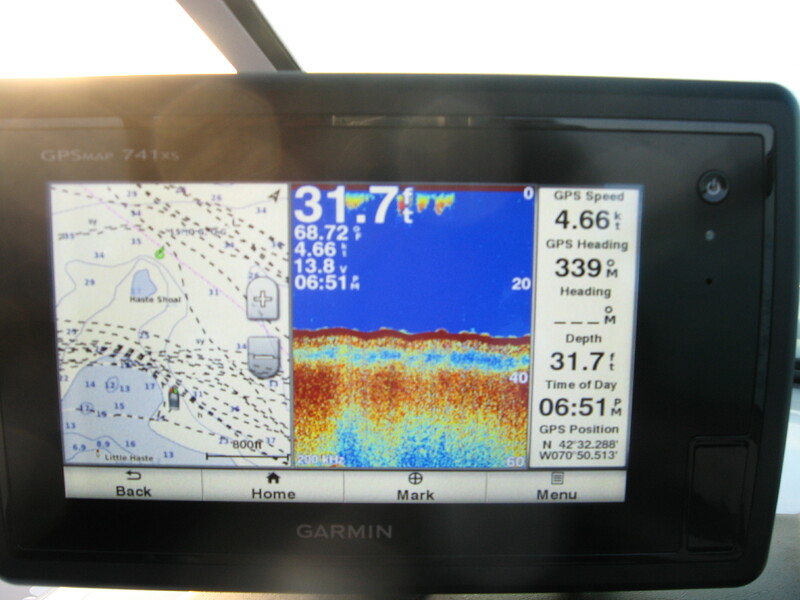 One thing, though, is no matter what the water levels are, I would think that it would only be a good thing to use your GPS as much as possible and familiarize yourself with potential changes in the water level and make adjustments accordingly. I don't know what I would do without that thing. I use it ALL the time. You are approaching the tour boat wakes all wrong..... I've been boating on lake powell since the mid 70's and have never hit a whale but then my experience gains me the knowledge of where to avoid them. The guys at Dangling Rope said they get sued all the time and more than one boat has been lost in their wake (pun intended). Whales are unnerving. I have been back there in that area, not a lot of fun when consideration of others is lacking. I feel your pain, I know what you mean. I was on Lake Pleasant last summer with my son. There was this island there, that is now a peninsula. They said that they were down around 50%. I was looking at bath tub rings that were 40ft above the water we were on, That is one big lake, and a whole lot of water gone. Here on The Great Lakes we are a couple of feet above normal, so boaters are crossing areas and going places that they normally don't. Denny. I have always wanted to go boat in lake Powell.... Maybe now not so much. The lake I go to in New Mexico, Conchas Lake, I have seen at Max lvl and 40ft below that. Know it and the low spots VS water lvl like the back of my hand. Kinda makes me nervous to visit Powell now. I've encountered thousands of tour boat wakes over the years and have never once felt I had faced potential death in a random moment of boating. If the wife is down below a warning that big water is approaching but other than that just slow down and hit them straight ahead as possible. The other question is how up to date are the charts with changing water levels? You should check out Navionics. Run it on your phone or iPad. My Raymarine chartplotter uses Navionics charts too, but the feature I am about to mention isn't available to the Raymarine system. If using iPad/iPhone, you can adjust the lake level from "normal pool". All you have to do is figure out what "normal pool" is for the lake, then in the settings change the water level to the number feet below normal pool the lake is currently at. This updates the symbology and now something that was 50' below the surface during "full pool" is now shown as at the surface (assuming a 50' drop occurred). Works like a charm on Texoma. Phillbo, I get it and agree with best safety practices with people on the boat and just take your time. I was using my boat to test its limits and see what I could do (alone). I might be reckless to some but sometimes I like to see what my stuff can do. I was close to the canyon buster on his highest point of his wake. I thought I could get over it and backed off at the last second. Who knows, maybe I would have made it but I blinked. If I had been tossed over it would have been my fault. And thank you for the milk jug tip before I went, I left a few. The unnerving part was the unmarked stuff and some of it was in marked lanes. WOT and launch it !!!! That's pretty dammn cool. I wonder how it updates the change in depth without a sensor of some type that is actually dipped in the water. Or does it take the info from the boat's transducer/smartcraft or GPS of the lake's depth reading at the time and then computes new depths? Let's say there's a shallow area that is typically 10 feet underwater at full pool and shown with depth contours. Now, let's say that you tell the chart that the lake is 11 feet down from full pool. Navionics simply shows this area as dry land now as it is exposed since the lake is down. Has nothing to do with depth readings or transducers (other than Navionics does take transducer data and uses it to update their charts...called sonarcharts). It is simply adjusting the contour markings based on where you set the water level. Hope my ramblings make sense. Now, let's say that you tell the chart that the lake is 11 feet down from full pool. Navionics simply shows this area as dry land now as it is exposed since the lake is down. I get it. So you basically have to punch in the current depth of the lake yourself and then it automatically updates the rest of the info based on that information. Exactly. It keeps the different depths shaded so you can tell the deeper water at a glance. It won't help you with submerged objects such as rocks and wrecks, though as they aren't typically mapped with any depth. But at least this shows you where the shallow waters are. We have never seen anything you speak of. No hidden gems etc. We go every year several times a year, dock in waheap. boat up to rainbow bridge etc. I have never seen any of the dangers you mention. Our 252 smashes any wake we see and hardly disturbs us. Ill post a bunch of pics in minute along with video. Its is an amazing place. we love it. Ahhh.. the Maytag Straights.... I avoid that area after sunrise during the "season".... I'll use the cut if open. We were up around Christmas and the narrows was like glass even in the afternoon.. No tour boats running. Now you have me curious to use my technology. I have a dual screen Garmin set up so it should be easy. Thank you. I was looking at those dual screen Garmin setups Chaparral is installing now on their new boats. They look great. I guess eliminating all gauges has its benefits. Are they angled on yours like in this pic below? I would think just that little angle towards each other would make a huge difference in ease of reading. That's a long time coming. I wish they did that on my boat., although it would take me a bit of time to get used to no gauges and looking at all of the info on screen. Yes! The screens are angled perfectly. It took my eyes a few hours to really get digital vs. analog instruments but not long. The edit function of these screens is a whole new generation of personalizing what you want to display from a huge menu of options. Hold your finger in place get a menu of choices categorized by sections, drop something in to your dashboard. "not sure what purpose can be served by trying to cross a tour boat wake up close﻿ to the boat"
Just being a fool riding his wake, I am not the brightest bulb in the lamp. Thought it might be a good idea to body surf with a 25 ft boat. Speaking of body surfing, last time I did that a few years ago I had a full rotator cuff tear. Took me to about now after surgery to recover. I am still body surfing and being an idiot. When I go up lake with friends in a house boat and feel a tour boat is going to pass too close I hail them and ask them to come off plane and they always comply. I don't bother in my cruiser but I've seen houseboats take water over the bow from the wakes. They only run twice a day so in the scheme of things it's really no big deal.